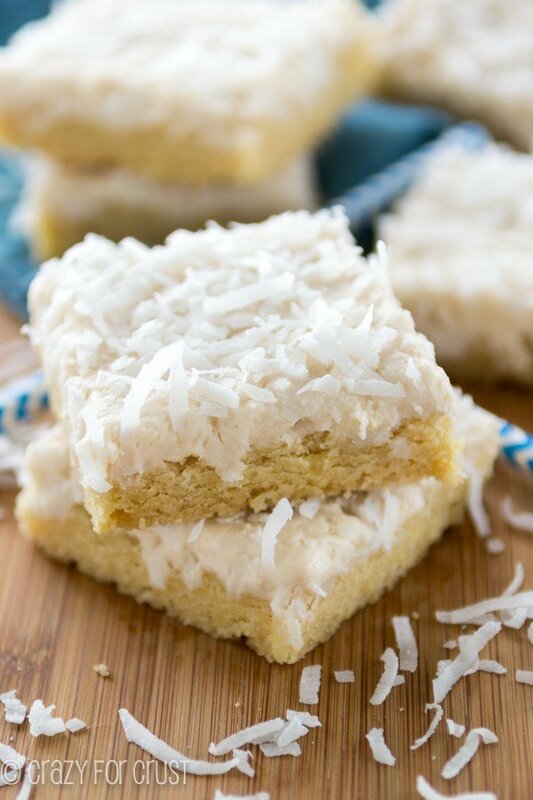 Gooey Coconut Pie Bars – We can all just say I’m crazy for coconut, especially after making these! CLICK TO PIN AND SAVE FOR LATER! Whenever I say my blog name to people who are not bloggers and not in the food world, they say, “Oh, you sell pizza?” It constantly boggles my mind that people do not think about pie crust as much as I do. I think about crust multiple times a day. I think about what pie I can make next. I think about what dessert I can make into pie. I think about what recipe I can give a crust that doesn’t have one. You could say I’m crazy for crust, obviously. My goal in life is to give every single dessert a crust at some point, and to turn every pie I love into something else that’s secretly getting pie into every other dessert. The goal for these Gooey Coconut Pie Bars was to turn my favorite coconut pie into a bar cookie with a shortbread crust. I think my other goal in life, as I mentioned last week, is to make as much coconut dessert as I want all year long. I cannot believe I went 34 years of my life thinking I hated coconut. These bars are like a gooey bar married a coconut pie married shortbread bars married pie bars. You know, if food could marry more than one thing at a time. The base recipe is from these Chocolate Almond Toffee Shortbread Bars, that have a buttery shortbread crust and a gooey sweetened condensed milk filling. I took out the chocolate and almonds and toffee and added COCONUT. 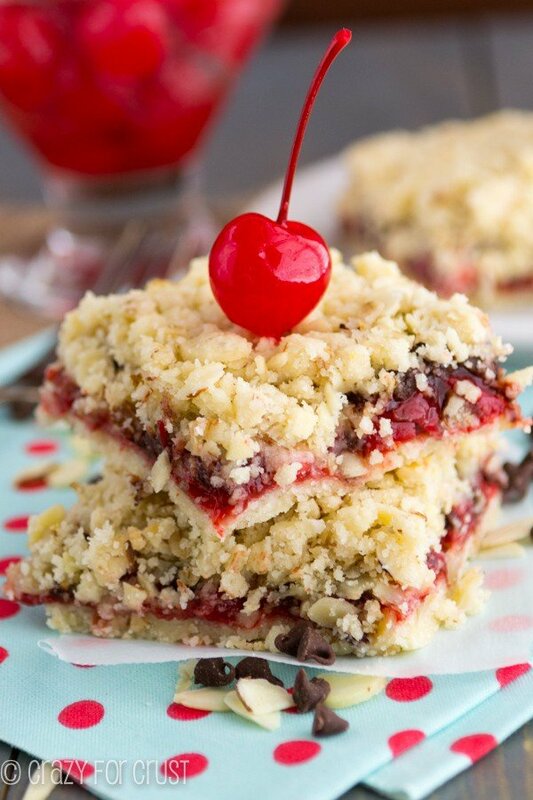 The result of these Gooey Coconut Pie Bars? 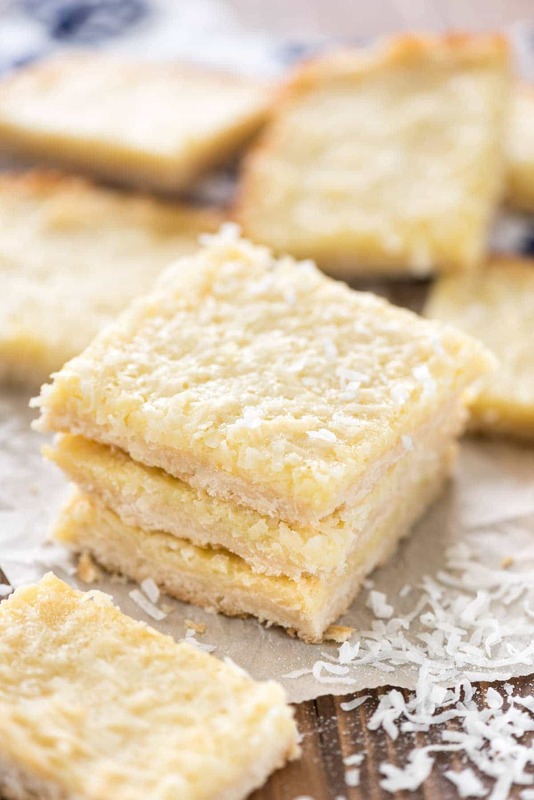 A gooey shortbread bar that tastes like coconut pie. Don’t tell anyone, but I think I love making pie bars more than I love making traditional pie. One, it’s easier to cut. Two, it’s easier to eat – no fork! And three, it’s easier to store, freeze, and package for giving. 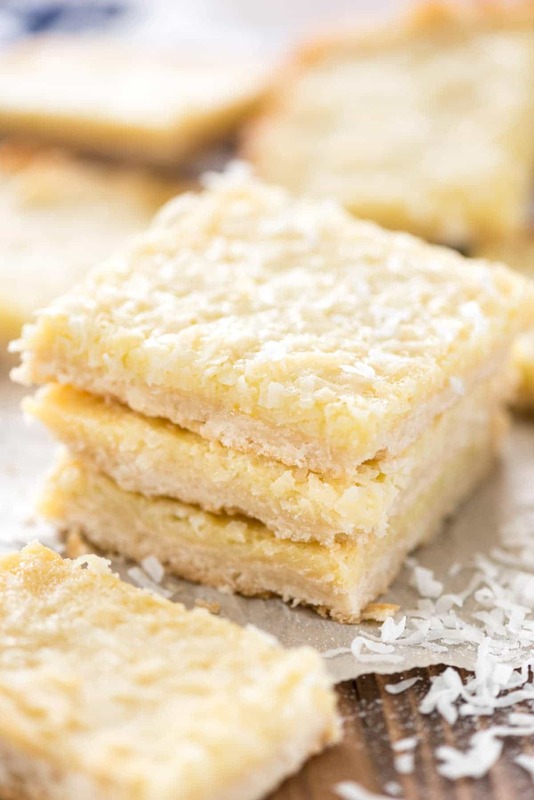 In other words, these Gooey Coconut Pie Bars are perfect for anything – a party, a potluck, giving to a friend, or just because you love coconut and it’s Tuesday. You must try them if you love coconut! Line a 9x13” pan with foil and spray with cooking spray. Preheat oven to 350°F. Place butter, flour, salt and powdered sugar in the bowl of a stand mixer fitted with the paddle attachment (or use a hand mixer). Mix until smooth a cookie dough forms. Place shortbread in the prepared pan. Spray your hands with cooking spray and press to a thin layer in the pan. Bake shortbread layer for 15 minutes. While the crust is baking, stir together sweetened condensed milk, egg, and coconut extract. Stir in coconut. After 15 minutes of baking, pour the milk mixture carefully over the hot crust. Continue baking for about 17-19 minutes until the sides start to look golden brown. Cool completely before cutting into bars. Store in an airtight container for up to 3 days or freeze for up to one month. Check out all of my pie crust recipes for even more inspiration, and my gooey bar recipes too! I life without coconut would be so sad 😉 So glad you had a change of heart cause these bars are phenomenal! I’d say you are winning in the dessert crust department! Love these pie bars. So coconut-y and gooey!! I love love pie crust too! And turn coconut pie into bars with crust is just genius!! Since we are having easter fasting time. Pinned it for march 27th special on easter day. Thanks dear for sharing a wonderful lovely recipe??? Sold! And I just so happen to have all those ingredients on hand! 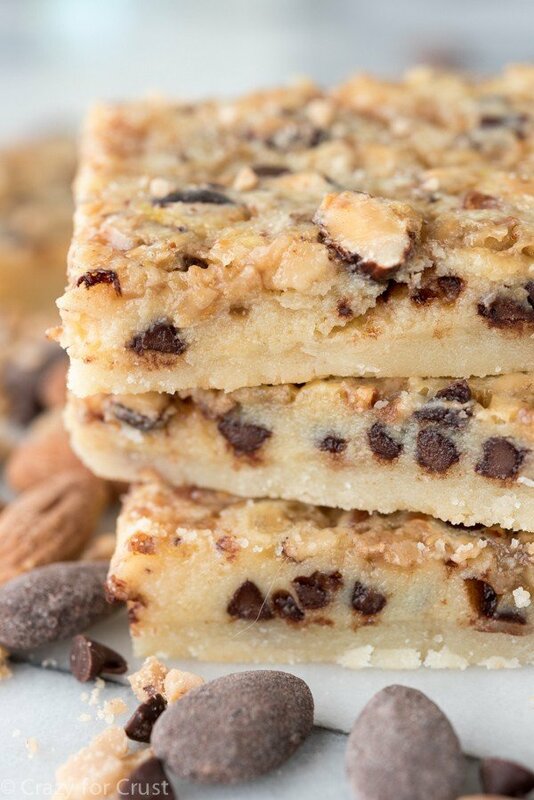 I l o v e coconut and these bars sound heavenly! Question: How do you store the bars? Not that they will actually last more than a day. You can store them in a ziploc or a tupperware. Place parchment or wax between layers so they don’t stick, and you can freeze them too. Enjoy! Just made these and the cinnamon roll blondies for a graduation party. They were both incredible. Can’t say which I liked better as I LOVED them both (and the crowd choice was about 50/50). Those who liked coconut went for the coconut bars, but I guess some people (not me!) don’t like coconut. Thanks Dorothy for the great recipes! I’m so glad you enjoyed them!! Yay! This is delicious. 5 star to this post for sure. Thanks for sharing. AWESOME!!! I’ve been craving a yummy coconut something or other for about a month now. I had even purchased certain ingredients in anticipation of the perfect recipe and just happened to have everything I needed when I found it. Rather than pressing down the crust with my hands though, I put a piece of wax paper over it and used a rolling pin. The paper peels off perfectly and the crust is smooth and even. Thanks for the great recipe. Thanks I did it with pear butter since I didn’t have apple butter yet.out of this world. Awesome recipe, Can’t wait to try this coconut recipe. Thanks for sharing. These look amazing! Do you think substituting Coconut Cream for the sweetened condensed milk would be an option? The Gooey Coconut Pie Bars are excellent! I added toasted coconut to the top right after they came out of the oven. What a great recipe that can be frozen. So much more convenient than making a pie.